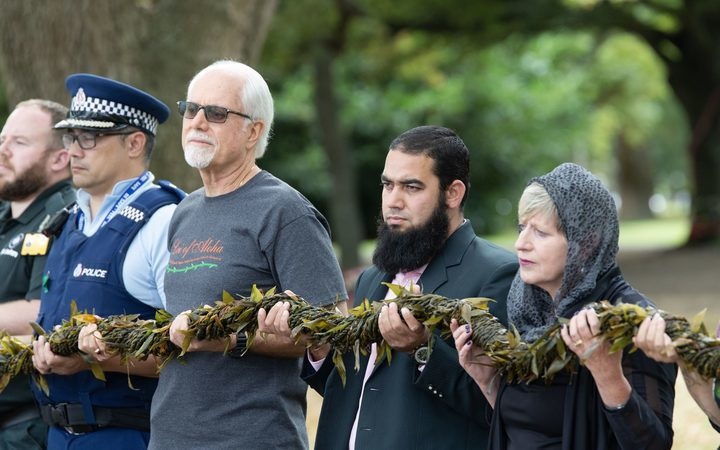 The mile-long lei was gifted to the city of Christchurch in the wake of the mosque terrorist attacks on 15 March.A Hawaiian delegation has gifted a mile-long Lei to the city of Christchurch. 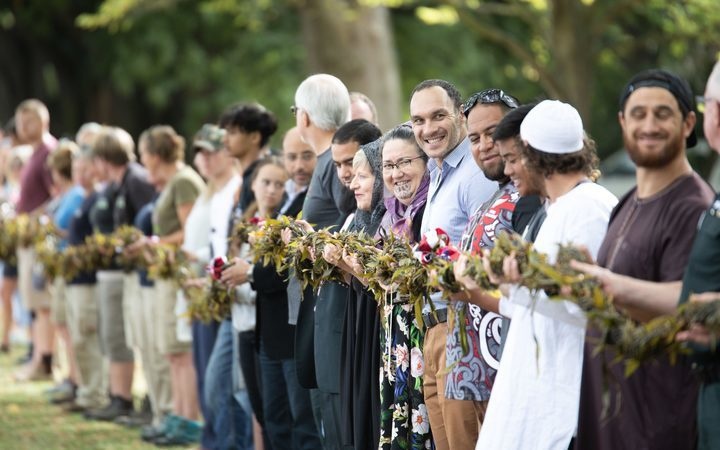 The mile-long lei was gifted to the city of Christchurch in the wake of the mosque terrorist attacks on 15 March. 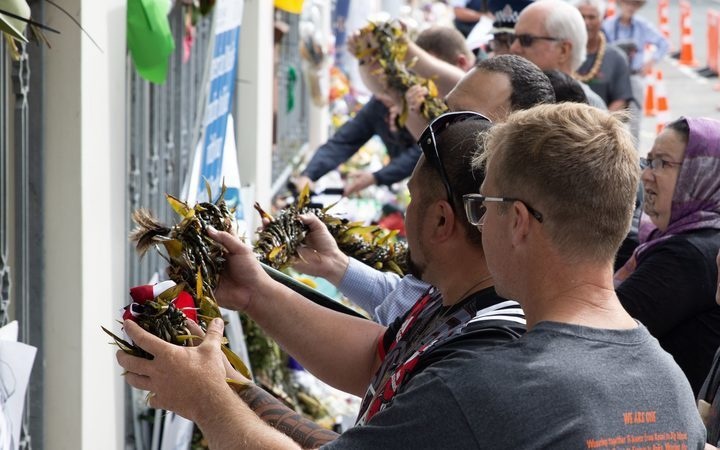 Almost 8000 kilometres from home, the six delegates from Hawaii stood in front of four plastic bins on the border of Hagley Park – directly opposite Al Noor Mosque where 42 people were killed. Inside the bins sat eight sections of lei – one for each mosque, the hospital, police, St John ambulance, Victim Support, Ngai Tahu, and one for the city of Christchurch. The gesture began after the terrorist attacks in Paris in 2015, and has been repeated following other tragedies like the Parkland and Las Vegas shootings. Members of the Hawaiian delegation at the lei ceremony. Lei of Aloha for World Peace delegate Robert DeVinck said it took 300 volunteers three days to weave together 14 truckloads of ti leaves. “These tragic situations, people need hugs around the world and a reminder that after seeing the face of evil, seeing hatred in such fashion, they need to be reminded that the majority of the world wants to do something to comfort them, to bring love and peace to them. “Most people understand a lei is usually a ring of flowers, usually very fragrant flowers like tuber roses that you give to someone as a greeting, as a sign of love,” he said. Christchurch Mayor Lianne Dalzeil, Shagaf Kahn and emergency services staff receive the lei. After being presented, the lei was held above waist height in the hands of the Muslim community, including Muslim Association of Canterbury president Shagaf Khan, Christchurch mayor Lianne Dalziel, representatives from Ngai Tahu, emergency services, as well as members of the public there to watch. 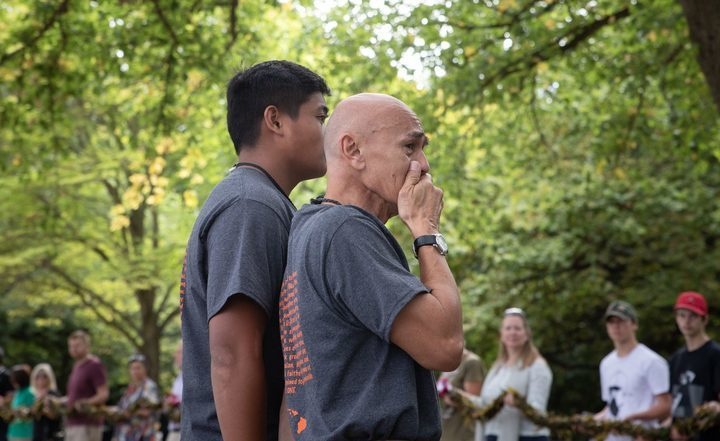 “During the time they’re weaving this, they’re giving their mana, their spirit and their love into this lei,” Mr DeVinck said. “So as I was holding it just now I was thinking of all the volunteers that have brought their mana, their love and their compassion in that lei from the island where I live. St John District operations manager Wally Mitchell stood holding the lei alongside his ambulance and police colleagues. “It’s very moving to be given the opportunity to be a part of this coming together of people, not just from around the country, but around the world. He said while the earthquakes had created resilience in the Canterbury community, the level of support and connection had gone up another level. “It’s actually connected across faith, it’s connected across race, it’s connected outside the borders of New Zealand, it’s actually brought people together unlike any other event. “Other countries it happens and it polarises people, I think we’ve seen the opposite here. It’s very heartwarming,” Mr Mitchell said. A section of the lei was draped over the fence at Al Noor Mosque as the delegates shared hugs, well wishes and song. The other sections are being gifted to the Linwood Mosque, Christchurch Hospital, police, St John ambulance, Victim Support and Ngai Tahu. The eighth section has been gifted to the city of Christchurch and will be added to the tribute wall on the edge of the Botanic Gardens.